The Sutherland Trail stretches for more than 70 miles on remote and lonely tracks through some of Scotland’s most spectacular wild scenery. It winds past hill lochs, along rivers, around iconic mountains like Suilven and Canisp all the way from the fishing village of Lochinver on the beautiful far northwest to the village of Tongue on the north coast. My old pal Noreen, who refers to me “Intrepid One” since I returned from the Camino, suggested we tackle it and being the great organiser that she is, plotted out our route and booked the bus tickets from Inverness to Ullapool and then on to Lochinver as soon as I enthusiastically nodded my agreement! So today my rucksack is packed, my boots are raring to go at the door and there’s hopefully enough down and feathers in my bag in the shape of jackets and sleeping bags to keep me warm overnight in my tiny one-man tent. We’re carrying everything on our backs: food, cooking gear, tents and essential Scottish walking supplies like a tick extractor. There would, however, appear to be no requirement for sun protection. The forecast this week is for highs of 8 degrees during the day, down to below freezing at night. And snow. And rain. 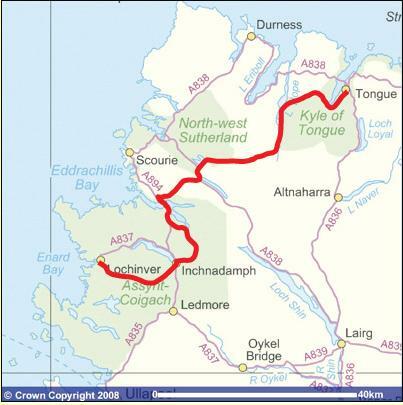 However the buses from Inverness to Ullapool and from Ulapool to Lochinver are booked and we are committed.